Has the DAW improved enough to justify the price? Cubase Pro 8's innovative new features and smoother performance represent a further step forward for this superb DAW. Render in-place, at last! Chord pads are inspirational. Multiband Envelope Shaper is great. Performance noticeably improved. Still no mixer undo... Can't render sidechain plugins in-place. Some bugs that need addressing. Wave Meters aren't really meters! For the release of version 8, Steinberg has renamed the top-tier version of its venerable DAW from simply Cubase to Cubase Pro. There's still a cut-down Artist version available (Cubase Artist 8, £244), but we're just looking at Pro 8 here. It's brimming with tons of new stuff, so we'll jump right in. "At long last - there's an easy, intuitive and full-featured render in-place function"
In terms of UI, Cubase Pro 8 doesn't make any big changes, with the exception of the docked MediaBay, occupying over a quarter of the right-hand side, which also tabs into the VST Instruments Rack. We're not sure that we care for its incursion into the project window's space, but if you're the type of user that makes heavy use of the MediaBay, you may find this to be a time-saver; and it can be undocked, anyway. On to the more significant changes and improvements. From the "what took you guys so long?" drawer comes - at long last - an easy, intuitive and full-featured render in-place function (although it actually bounces to a new track, rather than being truly 'in place'). Cubase has had audio export and track freeze for ages, but now we have an excellent rendering system, with options for where the resulting file should be stored on your drive and what should be included in the bounced track. There's also a Dry option, which renders an instrument or audio track and copies all effects and settings to the new track, rather than burning them into the bounce. You can also elect to render with or without master output effects, and choose to mute the original (which we're surprised to see isn't done automatically). The one disappointment is that sidechained effects aren't bounced. 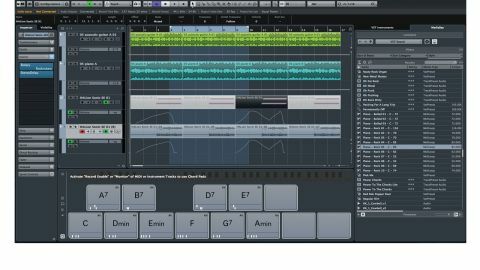 MIDI power users will be pleased with Cubase Pro 8's ability to perform MIDI tempo detection: essentially, a tempo track can be created from any recorded MIDI performance. It works well, and is helped along by thoughtful options like offbeat correction and tempo smoothing. We experienced a glitch while playing around with MIDI tempo detection, wherein Cubase's metronome would become inaudible. This is a known bug, and Steinberg recommend using a MIDI click instead - not really an acceptable solution, so hopefully it'll be fixed soon. The new VCA Faders feature enables multiple volume faders to be linked and controlled as one under the control of a new fader in its own channel, without disturbing the relative positioning of the originals. This is ideal when you have a perfect balance of multitracked backing vocal tracks and want to fade all the tracks in or out as one, for example - and unlike using a group bus, post-fader send effects applied to the tracks will 'follow' the adjustments. VCA faders include the ability to link any combination of channels, no matter their destinations, even if they're routed to different busses. You can automate both channel faders and VCA faders and they won't 'override' each other. Furthermore, VCA fader groups can be nested - that is, VCA faders themselves can be assigned to a further VCA fader. It's powerful stuff and as easy as can be - just select the channels, right-click and choose the option from the menu. It works beautifully. Next, a new automation function called Virgin Territories. A Virgin Territory is a section of automated track that hasn't been subjected to automation. With Virgin Territories switched on, the space between the end of one section of automation and the start of the next one is left completely free of automation, rather than being filled in automatically with a line joining end and start points, as was previously the case. This is useful for making adjustments to the automated parameter within the Virgin Territory without them being overridden by automation. "You can now swap the channel meters in the Meter Bridge for Wave Meters - real-time vertically scrolling waveforms, which look cool and make for a handy visual reference"
We loved the addition of the Chord Track in Cubase 7, and version 8 takes that side of things a step further with Chord pads, a fun auto-chord-like function that allows you to set up custom chords on a set of virtual pads for triggering onscreen or via MIDI. You can change voicings on the fly and record your jamming, and there's a circle-of-fifths view, from which chords can be dragged directly onto the pads, as well as the Proximity Chord Assistant, which helps you pick out harmonically related chords. We should also mention the new Direct Routing section in the MixConsole. Looking like the Insert slots, available destinations are selected by clicking within the allotted space. This selection overrides your usual output bus setting, allowing tracks to be one-click re-routed to any of eight user-configured destination buses, or even route to multiple destinations at once with the Summing mode. You can now swap the channel meters in the Meter Bridge for Wave Meters - real-time vertically scrolling waveforms, which look cool and make for a handy visual reference. However, it is just a display of audio events on a track, and not a real-time oscilloscope-style meter of a channel's processed output. Plenty of lesser additions and tweaks have been made, too, including improvements to ASIO Guard, better performance, improved window handling on PC, an integrated plugin manager, better integration of VST Connect SE, and some new plugins. And overall, this version feels snappier and more responsive. It's not without a few glitches, but none are show-stoppers - oh, and there's still no undo for mixer or plugin parameter tweaks! - and overall Cubase Pro 8 feels just like what it is: a mature DAW that continues to evolve in interesting and creatively relevant directions.